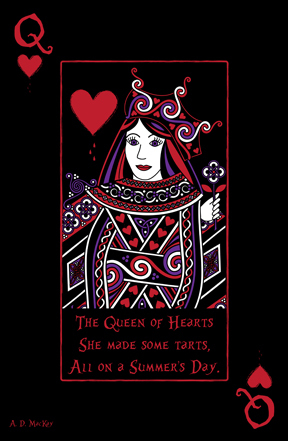 Description: Modelled after one of the more commonly seen images in a deck of cards, this Celtic Queen of Hearts is a darker take on the popular nursery rhyme, more in the style of Lewis Carroll's "Alice in Wonderland". With bleeding hearts, and red and purple highlights in her hair, this Celtic Queen has a definite gothic flair. This is the first panel of four, one card for each verse.